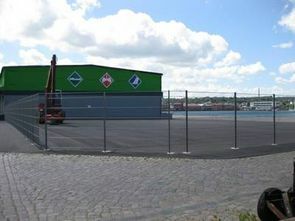 The Flensburg Port has got additional storage areas. The open-air space of apprx. 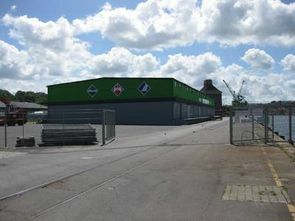 1.600 m² is situated within the ISPS area and can be used for goods that can be storaged outside such as split a.s.o. Maximal working load is 45 to / m² - that means loading and discharging is possible without any restrictions up to this amount. It is no every day procedure that a finish product is baptized with a typical beer from the region North-Germany and the minister of economic affairs attended this event. 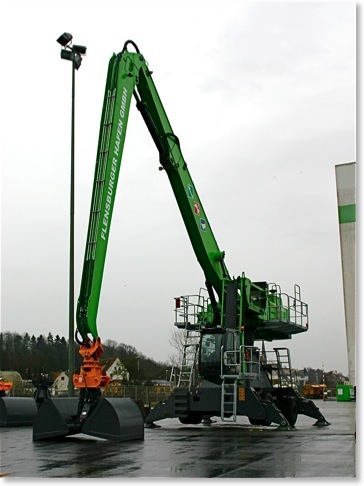 Focus of this inauguration party on Dec. 19, 2007 was the new mobile harbour crane Mantsinen MHC 60. This additional discharging capacity of about 350 to / h was strongly needed for Germany’s northernmost port. The crane’s godfather was Dipl.-Kfm. Matthias Wolfskeil. He is the Managing Director of the company Stadtwerke Flensburg GmbH, to which the Flensburger Hafen GmbH belongs as a 100% daughter. Frank Partik, Managing Direktor of Flensburger Hafen GmbH, welcomed about 100 guests to this event and it was a special pleasure to greet the minister of economic affairs of the region Schleswig-Holstein Mr. Dietrich Austermann, Flensburg’s Mayor Klaus Tscheuschner, Member of Flensburg’s parliament Mrs. Susanne Herold, the President of the Chamber of Commerce and Industry and also the President of Chamber of Crafts. “This is an early Christmas present not only for all members of the Flensburg Hafen GmbH but also for the business structure around the Flensburg Port” Frank Partik was very pleased. In total there is an investment of 1,88 Mio. Euro for two new modern mobile cranes during the year 2007 and 2008. That brings the Flensburger Hafen GmbH in the position to work much more productively and efficiently. This project is supported by 50 % out of means of Schleswig-Holstein – co-financed by European fonds for economical development - and another 50 % by the parent company Stadtwerke Flensburg GmbH.